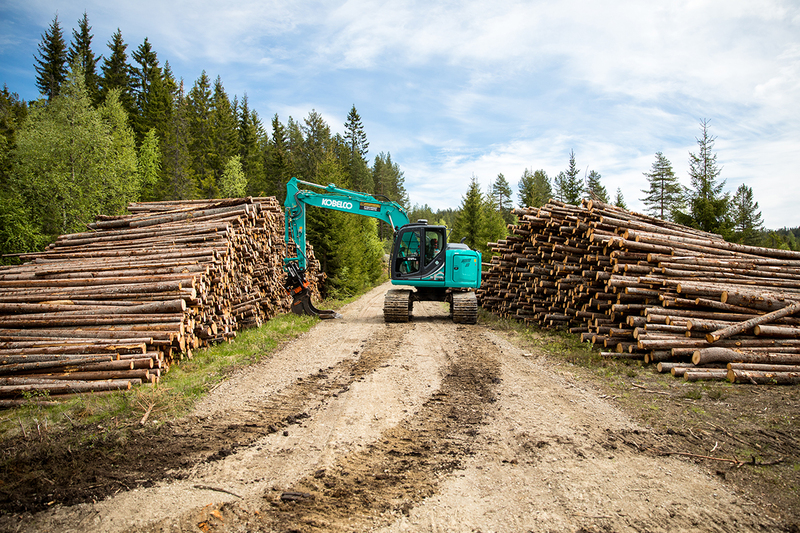 Ivar Mellemstuen - Kobelco Construction Machinery Europe B.V.
Forest logging has long been an important aspect of Norway’s economy and, perhaps more importantly, its way of life. Paper production and construction materials made from timber are a big part of the country’s product exports. The forests of pine and spruce have also provided the main materials for home building for many centuries. 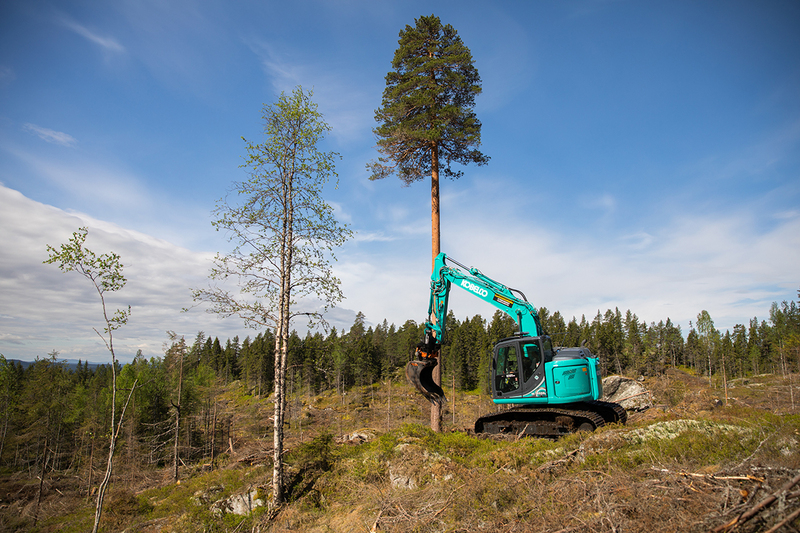 Controlled logging and forestry management is also one of the biggest providers of employment in Norway. To view the sprawling mass of Norwegian forests for the first time is unforgettable. Man and wildlife (bears, wolves, deer and elk among other creatures) have shared this natural splendour for centuries and will continue to do so with forestry management in place – did you know it is law that anyone can walk the forests without hindrance? Logging and forestry development requires specialised equipment and the care of the people who live and visit the wooded areas, but especially those who work within the forests. Under the direction of Gunnar Filtvedt, a former manual forest worker, GM Skogsdrift AS is one such company who specialises in forestry logging and management. The Rena-based company started with two men and two machines and currently has 13 machines and 14 men to cover approx. 170-200,000m2 forests with sales of about NOK 25m a year. The words of Ivar are an understatement – the nearest large town is approx two hours away and small villages are literally scattered through the mountain forests and there’s a greater chance of Ivar meeting elk and deer while working in the mountain forests. And yes, he has seen wolves. 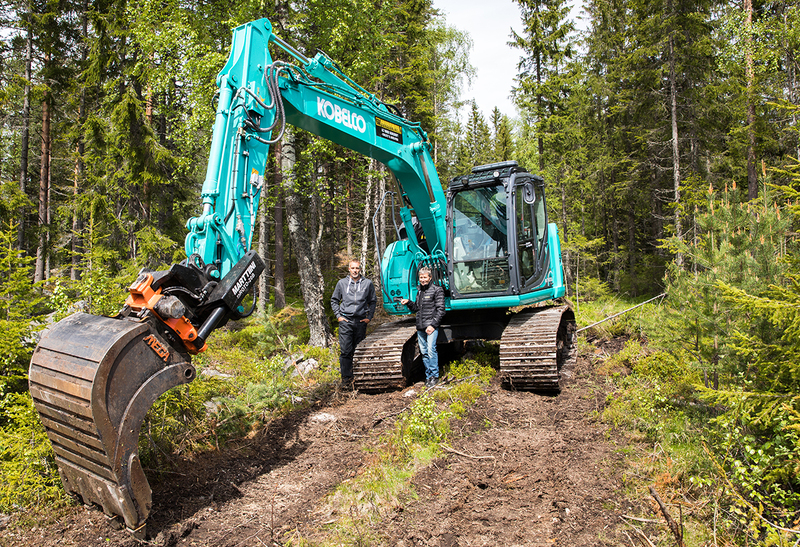 Although working in the forests for some years, Ivar has only recently been introduced to the Japanese brand Kobelco. So why exactly is a Japanese excavator working on a mountainside where even the passing elk sometimes struggle to walk? 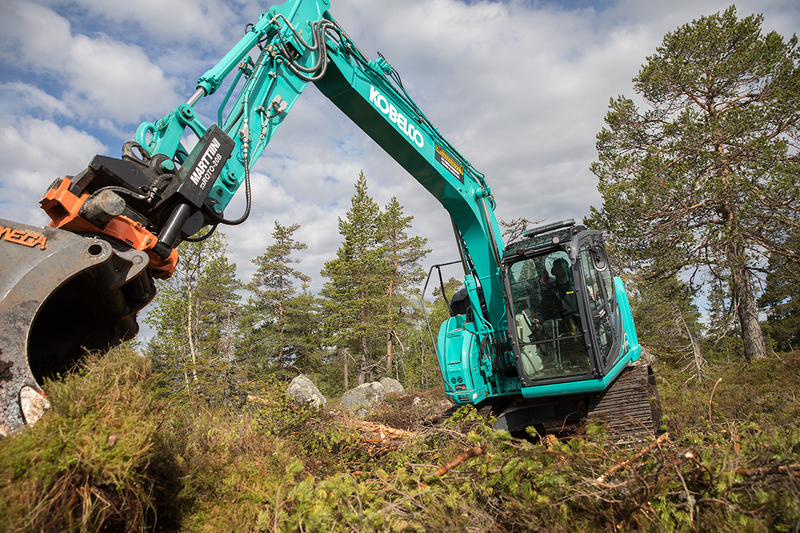 The role of the Kobelco SK140SRL-5 is to level the area where the logging machines have worked in order to keep natural streams clear and to avoid rain water and melting snow pooling and running down the mountainside to erode soil and natural vegetation. Keeping the forest floor looking natural is one thing, but it also serves the purpose of stabilising the forest’s ecosystem and preparing the ground ready for planting new tree stocks. 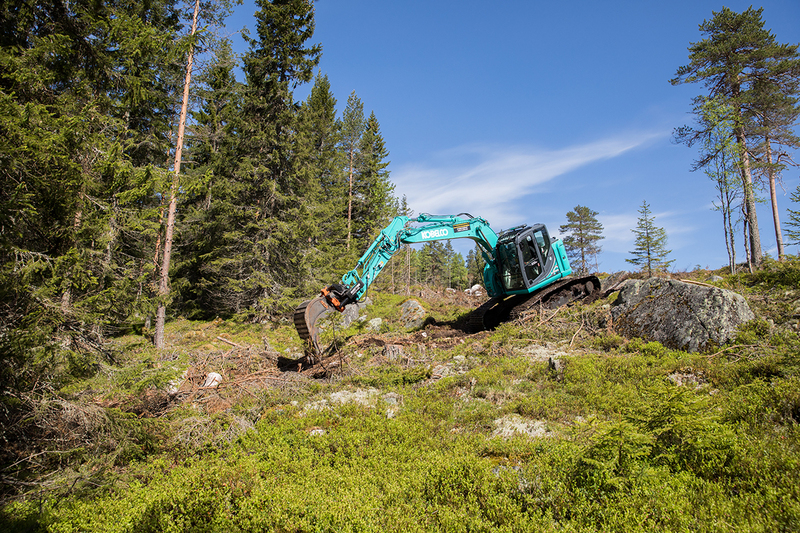 Ivar is the first to admit that traversing forest and rock floors on mountainsides are difficult working conditions for a tracked excavator. 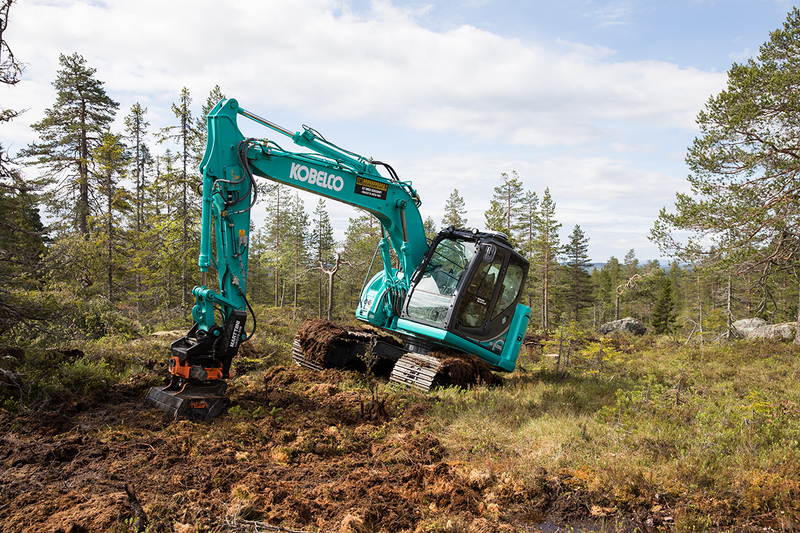 The ground conditions mean that the arm, boom and bucket system is frequently used to “dig in” and assist pulling the SK140SRL-5 up and across savage inclines and provide stable support on downward travel. This, of course, requires full performance from both the excavator’s engine and hydraulics. “There are times when I feel I need more performance to help pull, but these are not your everyday working conditions”, says Ivar with a smile. 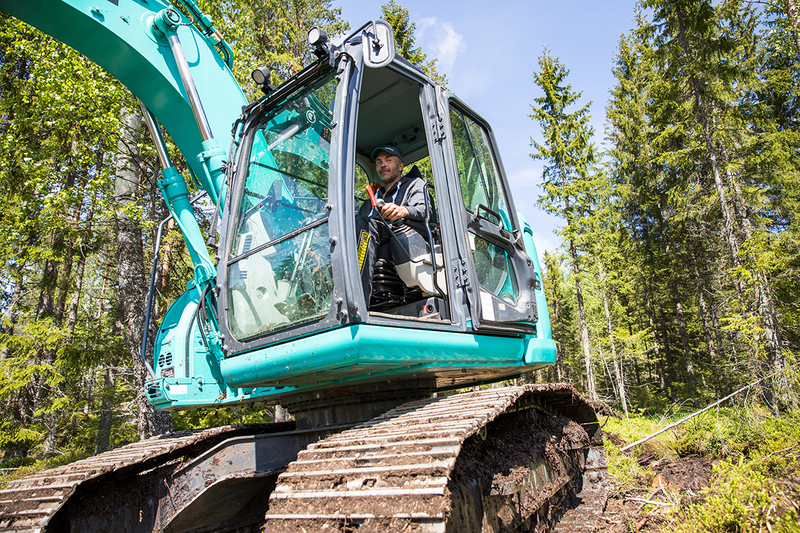 The subject of boosting boom performance is being discussed with his Kobelco dealer. 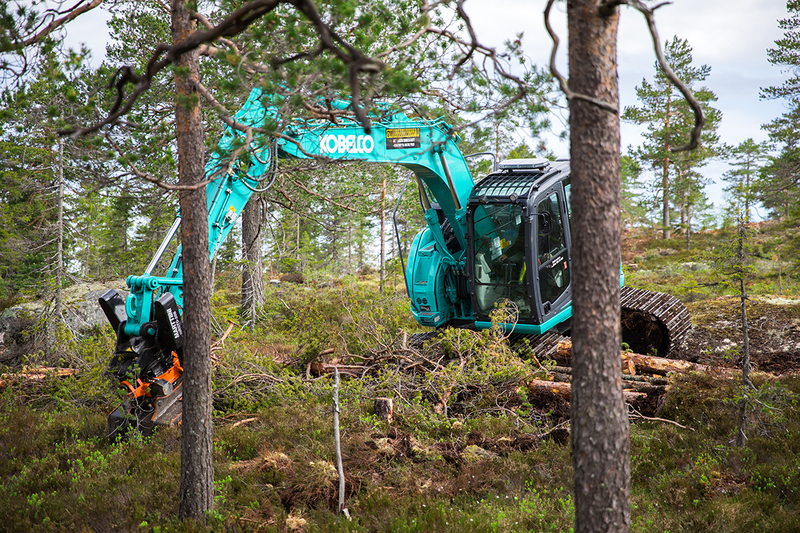 The Kobelco SK140SRL-5 carries the “L” designation denoting that it is equipped for logging. The height of the undercarriage that Ivar loves is due to the fact that the machine has the same components as a 20t class machine, even down to the 700mm track width. 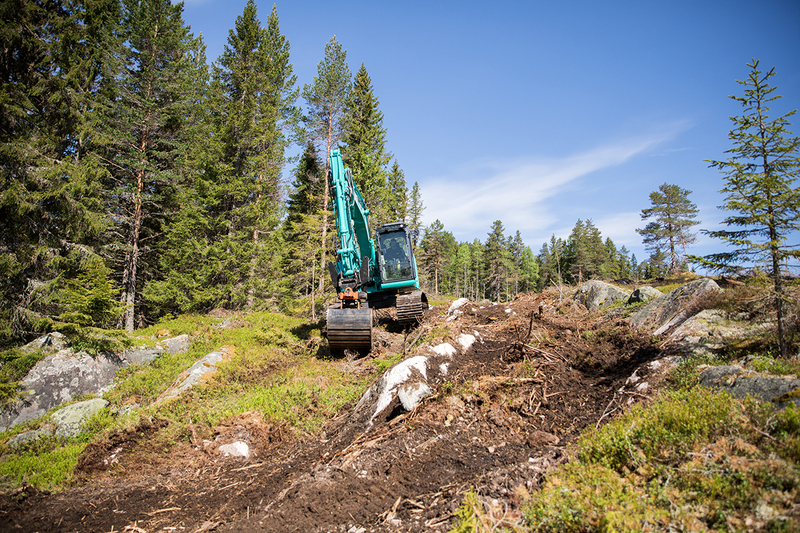 To see Ivar travel up and down and work on and around severe rock covered inclines it is obvious why the SK140SRL-5 was his first choice. If ever a lesson in precision excavator operation is required then we are sure Ivar and his SK140SRL-5 are the perfect teachers. Another important aspect of the SK140SRL-5 is its quietness. From the roadside the engine is very quiet thanks to the iNDr (Integrated Noise & Dust Reduction Cooling System). Even when moving through the forest, the loudest noise to be heard is the breaking of stumps and the sound of metal tracks against granite and other types of hard rock. Deer and other wildlife keep a distance from Ivar and his SK140SRL-5 but they don’t appear to be overly bothered with the mechanical alien in their forest. Ivar’s SK140SRL-5 features an additional attachment to the arm. 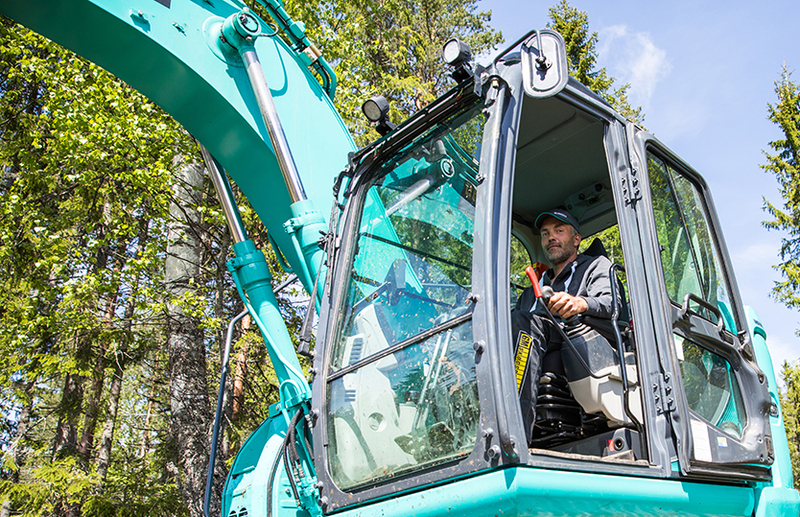 The use of a Marttiini metal tilt rotator (Mroto 20B – operated in cab with roller toggle switches) allows Ivar to rotate and tilt his bucket in every direction regardless of arm position, which is particularly useful if on an incline wedged in between trees. And, the SR (Short Radius) nature of his SK140SRL-5 means Ivar can place and operate it in very confined spaces.